If you’re serious about blogging and business, you need an email list. When you have someone’s email, you’re allowed to communicate with them when you want, how you want. And when you communicate well, you’ll see a MUCH higher response than any other mode of communication. What’s Better? 1,000 Clicks or 50 Clicks? 1,000 highly targeted clicks absolutely crushes 50 clicks :-). Well, that’s the difference between email marketing and social media. Recently I sent out a link to my Twitter following, and that earned around 50 clicks in an hour. I also sent that same link to my Google Plus stream, and that earned around 75 clicks. Not great… but not bad either. When I sent out that same link to my email list (it’s about twice as large as my Twitter and Google Plus following), I received more than 1,200 clicks. Yes, my email list might be twice as large as my social media following, but it generated about 24 times more clicks. After seeing my results, you can probably guess why I don’t promote my profiles, right? Right! I get better results from email. This isn’t a fluke either… It appears to be the facts. I know a lot of people who focus on both social media profiles and their email lists, and in each case, the email list absolutely crushes the social media profiles. So, beginning today, you need to stop promoting your social media profiles at the expense of growing your email list. You can still link your social media profiles… at the bottom of your sidebar. But at the top? That’s where the email signup form belongs. And you don’t want those pesky social media icons anywhere near it because it might tank your conversion rates. 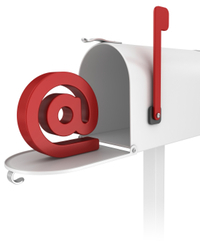 How Can You Start Growing Your Email List? If you’ve made it this far, I’ve likely sold you on the power of email marketing. And that means you’re ready to get some real results :-D.
First, you’ll need a reliable email provider. I recommend Aweber because its easy to use, and has loads of stat-tracking. Then, you’ll need to add email-signup forms to your website. If you’re using Thesis, it’s a cinch. Follow this tutorial here. Finally, to kick-up your email list growth, find your most valuable pages, and optimize those pages for email conversions. Read more about that here. Once you follow those three steps, you’ll be well on your way to building an email list. However, if you want that list to get you great results, you’ll need to treat that email list right. If you don’t, people will unsubscribe, and worse, people may not even open your emails. To prevent that, you need to be more personable and approachable by email because that will make people WANT your emails instead of simply pressing delete without reading them. When you ask people what are you struggling with, you’ll learn how you can help your subscribers. That will give you ideas on what content to write, and what products to create. But most importantly, when you ask that question, people often reply to that email. Then, when you reply back, most subscribers will be amazed that you took the time to talk to them directly because it’s uncommon. This will help you stand out, and now people may start looking for your emails, instead of deleting them. Email marketing is powerful, and when you do it right, you can see great results. Now I’d love to hear what you think. Leave a comment.